Revolution Racing on NASCAR.com, originally uploaded by Revolution Racing. Bold move on late restart gives rookie second East win Read the lap-by-lap on NASCAR Home Tracks. 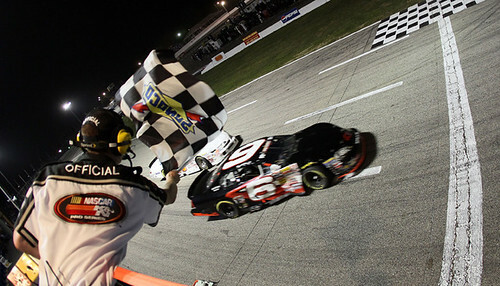 Darrell Wallace Jr. made a three-wide pass for the lead with two laps to go and held on for the victory Friday in the K&N Pro Series 125 at Lee USA Speedway. It was the second NASCAR K&N Pro Series East win of the season for the 16-year-old Revolution Racing driver from Mobile, Ala. “It definitely hit us right away this time,” said Wallace. “I’m excited, the whole team is excited. I was talking to the crew under the red flag and I told them [the leaders] are going to wash it up and I’m going to go under them and take the win and that’s exactly what happened.” Wallace started behind Ryan Truex and Eddie MacDonald on the race’s final restart. Truex and MacDonald had swapped the lead four times over the previous 35 laps, and appeared setting up for a final dash to the checkers for the win. But it was Wallace who had drove up through the field after getting tangled up in an early race incident and wound up stealing the spotlight. He dove inside the side-by-side leaders going into Turn 3, and emerged with the lead coming out of Turn 4 for his second win of the season. Wallace became the youngest driver and first African American race winner in NASCAR K&N Pro Series East history when he won the season opener at Greenville (S.C.) Pickens Speedway in March. Wallace, second in points, closed the gap on defending series champion Truex to 33 points with three races remaining. Marc Davis returned to the NASCAR K&N Pro Series East this weekend for the first time since 2008. He finished eighth at Lee USA Speedway in the No. 8 Revolution Racing Chevrolet. “I was really appreciative of Max Siegel and everybody at Revolution for putting me in the car this week,” said Davis, who is eyeing a return to the Nationwide Series at Dover in September. “These guys needed a good run. They’ve struggled the past couple weeks. Just had a bunch of bad luck. So they put me in the car for this one race, and we came away with a solid top ten.” Sergio Pena carried a special paint-scheme this weekend, promoting the upcoming docu-reality series “Changing Lanes,” which premieres on BET Network September 1. Pena drove the No. 4 Changing Lanes Chevrolet to a 15th-place finish at Lee USA Speedway Friday night, despite damage from a mid-race incident. Pena is currently 12th in the NASCAR K&N Pro Series East standings. Ryan Gifford saw his night come to an early end at Lee USA Speedway after getting caught up in multiple on-track incidents. The final blow to the No. 2 Revolution Racing Chevrolet came at lap 116 when front end damage sent the No. 2 machine to the garage. Gifford was credited with a 19th-place finish. He slips to eighth in the NASCAR K&N Pro Series standings, but is just 26 points out of fifth-place. The K&N Pro Series 125 will air on SPEED on Thursday, Aug. 5 at 6 p.m. ET. The NASCAR K&N Pro Series East will return to the track on Saturday, Aug. 28 at Gresham Motorsports Park in Jefferson, Ga.
Jessica Brunelli piloted the No. 2 Late Model to two top-10 finishes this weekend, including a fifth-place finish at Tri-County Motor Speedway on Friday night and a seventh-place finish at Hickory Motor Speedway on Saturday night. “It’s hard to complain about two top-10 finishes,” said Brunelli. “We did struggle with the car a little bit on Friday night, despite the fifth-place finish, but the guys worked hard to make some changes before practice at Hickory on Saturday to get it where it needed to be. We had an awesome qualifying lap, our best of the year at Hickory, and really had a good car for the race. It just took it a little bit to come in, which hurt us at the start of the race.” Brunelli qualified third at both Tri-County Motor Speedway and Hickory Motor Speedway. The third-place starting position at Hickory was the best of the year for Brunelli. Brunelli battled a loose race car to start the 50 lap feature at Hickory and dropped to ninth at the drop of the green flag as she waited for her car to come in. With the race going caution free, Brunelli had to earn her spots back on the track. She got stuck behind a pair of cars racing each other side-by-side for several laps. Brunelli remained patient and waited for an opening, and was able to pass both cars before the checkered flag. “It’s tough when you’re stuck behind two cars running side by side like that,” said Brunelli. “You try to be patient, but as the laps wind down, you’ve got to make a move. I waited for my opportunity and took it, and was able to pick up two spots on the track.” Brunelli now has six top fives and ten top 10s in 14 races this season. She has competed in six races at Tri-County Motor Speedway and eight races at Hickory Motor Speedway. Six of Brunelli’s 11 races this season have been at Hickory Motor Speedway. Her best finish at the 0.363-mile track is third. Brunelli has five top fives and seven top 10s in 11 races this season. She has been competing at Tri-County Motor Speedway and Hickory Motor Speedway. At just 17 years old, Brunelli is the youngest of Revolution Racing’s late model drivers. She is completing her junior year of high school via online college prep independent study. Hagar finished eighth in her last race at Hickory Motor Speedway on June 19. Hagar has three top fives and eight top 10s in 10 races so far this season. Hagar has raced late models in California for the last two seasons, competing at All American Speedway, Madera Speedway and Stockton 99 Speedway. Michael Cherry drove the No. 2 Late Model to a seventh-place finish Saturday night in the Third Annual Dwight Huffman Memorial Race for Charity at Hickory Motor Speedway. Revolution Racing teammates Jason Romero and Becca Kasten finished 20th and 23rd, respectively, after being involved in separate on-track incidents. Attrition was the name of the game on Saturday night, with less than 15 cars surviving to the end of the 177-lap feature. Cherry started 12th in the No. 2 Late Model and was able to stay up front throughout the race, avoiding the wrecks happening deep in the field. “I had a blast out here tonight,” said Cherry. “I can’t thank my crew chief, [Brandon] Chuck (Butler), Blair Addis, Andy Santerre and the whole team at Revolution Racing enough for giving me the opportunity to drive these race cars. These guys work their tails off and I get to have a blast driving these cars.” Cherry moved as high as second at lap 62, and ran in the top five for most of the night. A competition caution at lap 150 set the field up for a 27-lap shoot out to the checkered flag. Cherry was holding onto fifth-place when the final caution came out at lap 163. The No. 10 car of Andy Mercer was able to get by Cherry on the restart bringing the seventh and eighth-place cars with him. Cherry slid to eighth and in the closing laps was able to pick up a spot and finish seventh. “That last caution cost us a few spots,” said Cherry. “The high line was working good for us and there was no way Mercer was going to get by me on the bottom. The restart gave him the line he wanted and he was able to take the spot. We’ll take a solid top 10 finish, though, this was a tough, competitive field of cars out here tonight.” Cherry now has one win, six top fives and 12 top 10s in 13 late model races this season. Becca Kasten made contact with the inside frontstretch wall at lap 81 of the Dwight Huffman Memorial, when a car dove to the bottom putting Kasten in the middle of a three-wide situation. The cars bobbled and Kasten’s No. 5 AirTight Late Model got the worst of it, ending her night early. Jason Romero was caught up in a three car spin coming out of turn four just past the lap 100 mark. Damage to the No. 3 Late Model ended Romero’s night early, despite the crews best efforts to repair the damaged race car. Cherry earned his first career late model win at Tri-County Motor Speedway on June 11. He followed it up with a second-place finish at Hickory Motor Speedway the following night. Cherry has won two poles at Tri-County Motor Speedway this season in the No. 2 Late Model. After 12 races this season, Cherry has one win, six top fives and 11 top 10s. He’s competed at Caraway Speedway (Asheboro, N.C.), Hickory Motor Speedway and Tri-County Motor Speedway. Engine troubles ended Hagar’s night early in the Firecracker 150 at Tri-County Motor Speedway. She finished fifth in her last full race at Tri-County Motor Speedway on June 18. Kasten scored her best finishes of the season her last time out, finishing second and third at Tri-County Motor Speedway and finishing third at Hickory Motor Speedway. Kasten has three top fives and eight top 10s in 11 starts this season. She has competed at Caraway Speedway (Asheboro, N.C.), Hickory Motor Speedway and Tri-County Motor Speedway. 2010 is Kasten’s first season competing in the NASCAR Whelen All-American Series Late Models. She previously competed in an ASA touring series. Romero has won three poles at Tri-County Motor Speedway this season and tied for fast-time at a fourth event earlier this year. Romero scored his best finish of the season at Hickory Motor Speedway, a fifth-place finish, on May 15. In his first full season of racing late models at All American Speedway, Romero won four poles and 11 races on his way to the NASCAR Whelen All-American Series track championship. Megan Reitenour started her Fourth of July holiday weekend with a bang, winning the Firecracker 150 at Tri-County Motor Speedway on Friday night. Reitenour led 78 laps en route to her first career late model win. “I just want to thank my team, our sponsor, AirTight Mechanical, and everyone involved with Revolution Racing and the Drive for Diversity program for making this possible,” said Reitenour. “It’s been a long time coming and I’m glad I finally got that win.” Reitenour qualified second for the Firecracker 150 in the No. 5 AirTight Late Model, but dropped to third early in the race. She settled into third, exercising patience early in the 150 lap race. At lap 72, her patience paid off when the race leaders made contact and spun out, leaving Reitenour to inherit the lead. Reitenour took advantage of the situation, holding onto the lead at the restart and driving away from the field. The final caution of the race came out at lap 116, and Reitenour was again able to pull ahead on the restart. She continued to increase her lead and took the checkered flag with a straightaway lead over second-place finisher R.A. Brown. “Megan did a great job tonight saving her stuff for the end,” said Danny Johnson, crew chief of the No. 5 car. “She knew she needed to be patient early on to be there at the end and she did an awesome job of that tonight. This was a great night for Revolution Racing and the No. 5 team.” Reitenour, who earned rookie of the year honors at Tri-County Motor Speedway in 2009, has one win, two top fives and four top 10s in 11 races this season. She has been splitting her time this season between Tri-County Motor Speedway and Hickory Motor Speedway. Reitenour’s next scheduled race is a 100-lap event at Hickory Motor Speedway on July 17.